We have partnered with YouTube so that you can insert your product URL directly into your video to promote it. 1. Make sure that your YouTube account is verified. 2. Keep in mind that you can only verify an account that is in good standing. You can check the status of your account here. 1. 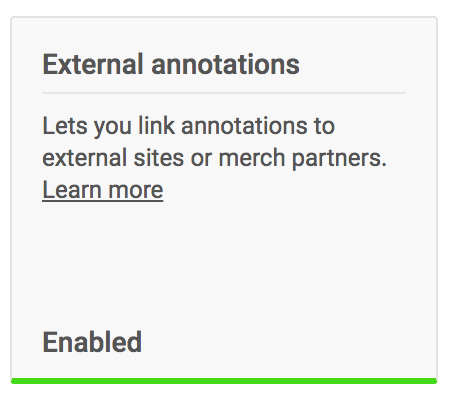 Enable external annotations under Channel → Status and features that will allow you to link to your Sellfy product page directly. 2. Click on Video Manager from the menu on the left. 3. Choose the video you want to add the promotion to, click on the drop-down menu. 5. In the page that opens, click the blue button Add card. 6. Choose Link and click Create. 7. Add your Sellfy product link and click Next. 8. Then add Card title, Call to action and Teaser text. How to add Youtube, Vimeo or Soundcloud media preview?